"The leading role of the new story is played by... Maleficent!? Start now and catch up with the main story updates!" Maleficent: "I've been lured into a trap?" Saw this a while ago, and I'm interested. Finally we're seemingly catching on with X's "secret ending". Another way to translate the characters they used is "leading role". Basically Maleficent will play a big part in this update! Lmao that SENA said the story wouldnâ€™t be important for KH3 and then SEJP puts this graphic out a month later. At least we can count on KHI. Thanks for doing what you guys do so those of us who care will be up to date. As I said elsewhere, my first instinctive thought was if they might be doing something related to the Maleficent film, where sheâ€™s the main character. But yeah, itâ€™s probably just that sheâ€™s the key role in upcoming events. The biggest point of interest for me is that, if this is a continuation of the Chi scene, it must mean either Maleficent traveled through time or the events weâ€™ve been playing through in UX must be running alongside those of the main series. My guess is weâ€™re in the Realm of Sleep during a continuous dream loop, which has now been interrupted by Maleficent. Perhaps, weâ€™ll have to free the Dandelions from the Unchained Realm in KH3? that wouuld be cool zip well dont we know two of them already though? Would be cool to see other Dandelions outside of the 4 leaders + intruder. I gotta imagine there are more who survived. hmm you are right i do wonder if daybreak town will contunie and wonder how the stretliza mystey will contuine plus who the coaty person on the title scene? Ya know, even if we arenâ€™t getting this in Global, Iâ€™m really excited for this new main story stuff that ties into KH3. I doubt weâ€™ll be seeing much, if any, filler between now and KH3â€™s release, so every month until then should have some interesting story tidbits to tide us over to January. Not sure what to expect from new characters but i'm hoping one of them is cool girl. Strelitzia better come back in some way though. Maybe she does and it counts as a "new character" too. *rolls eyes at Global* Nothing weâ€™d need to know, they said. Iâ€™m excited for this new content! Also looking forward to seeing the new characters! Looks like they're picking up the threads from where KHx's ending left off. Really interested to see where this leads; I wonder if it could tie into Maleficent's role in KH3. Okay, this switches things up a bit. 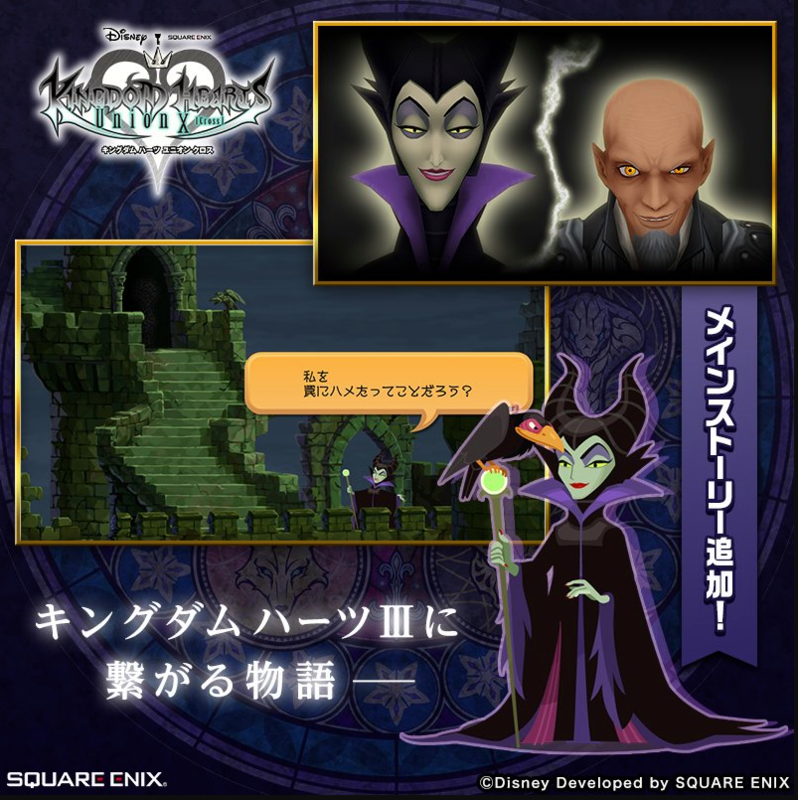 If this months update is to do with Maleficent in Enchanted Dominion, then next monts update is more than likely going to be lore in Daybreak Town. Which means to say that December is when we may get the new Disney world revealed for the game! Supposedly, Nomura suggested during the TGS that a big update was coming to Union Cross. Since we just got 3.0, I think he was referring to story. So Japan might actually get a big dump of story quests this month that revolve around both Enchanted Dominion and Daybreak Town. Then perhaps the new world next month. I just hope thereâ€™s a significant amount of story progression before we head to another Disney world. THEN WHAT THE DIDDLY IS THIS?! This will be an event quest(s) right? Cuz I'm only at 230 in story mode.